Farmers getting trained for beekeeping. The above pictures show how we can get the natural hives and how we can domesticate them. 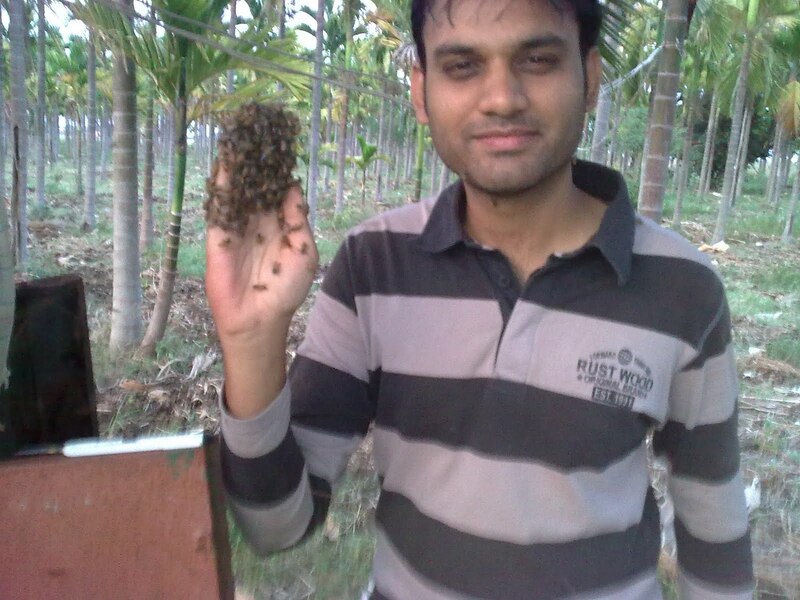 Apis Cerana indica( in kannada 'thuduve jenu') is a local species which we can find in many natural habitat like anthills,abandoned tyres, box, holes in coconut trees etc.. We train farmers to capture them and domesticate them in the bee boxes. We can extract honey which is very rich in nutrition. Cerana's honey is in great demand than that of the European species mellifera. Efforts are required to encourage and support a farmer if he wants to start up beekeeping for both pollination and honey production. 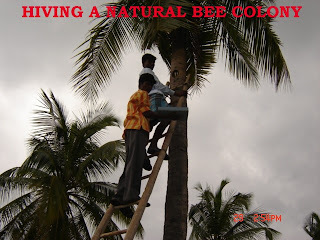 Interesting pictures of collecting limited honey from the apis dorsata colony..
By following this procedure we can save these major pollinators of nature..
Apis-Dorsata is a large bee found in india and other asian countries. These aggressive bees can establish there colony inside the city because they can travel nearly 6kms to collect nectar and pollens. In india, we can find these hives in the buildings,trees etc.. These bees are very aggressive when provoked. They chase until they sting on you!!. 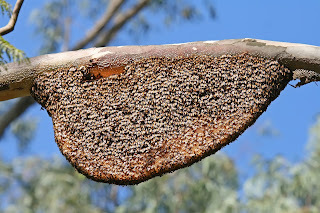 one hive may consist of more than 90,000 bees. Indian crops which are based on flowers and fruits are alive and in scope today because of Apis-Dorsata..